The goal of this document is to provide a brief overview of the hardware components that make up the FRC Control System. Each component will contain a brief description of the component function, a brief listing of critical connections, and a link to more documentation if available. Note that for complete wiring instructions/diagrams, please see the Wiring the FRC Control System document. The NI-roboRIO is the main robot controller used for FRC. The roboRIO includes a dual-core ARM Cortex™-A9 processor and FPGA which runs both trusted elements for control and safety as well as team-generated code. Integrated controller I/O includes a variety of communication protocols (Ethernet, USB, CAN, SPI, I2C, and serial) as well as PWM, servo, digital I/O, and analog I/O channels used to connect to robot peripherals for sensing and control.The roboRIO should connect to the dedicated 12V port on the Power Distribution Panel for power. Wired communication is available via USB or Ethernet. Detailed information on the roboRIO can be found in the roboRIO User Manual. The Power Distribution Panel (PDP) is designed to distribute power from a 12VDC battery to various robot components through auto-resetting circuit breakers and a small number of special function fused connections. 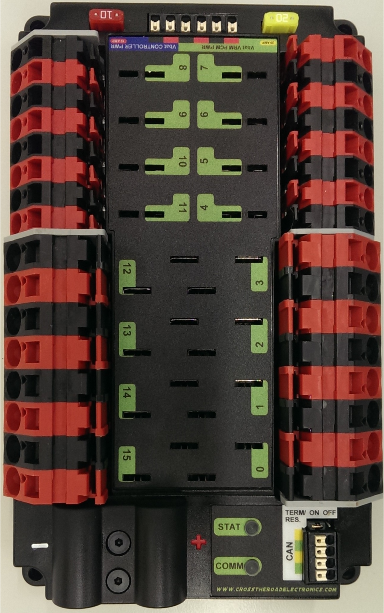 The PDP provides 8 output pairs rated for 40A continuous current and 8 pairs rated for 30A continuous current. 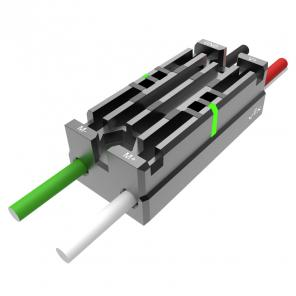 The PDP provides dedicated 12V connectors for the roboRIO, as well as connectors for the Voltage Regulator Module and Pneumatics Control Module. It also includes a CAN interface for logging current, temperature, and battery voltage. For more detailed information, see the PDP User Manual. The PCM is a device that contains all of the inputs and outputs required to operate 12V or 24V pneumatic solenoids and the on board compressor. The PCM is enabled/disabled by the roboRIO over the CAN interface. 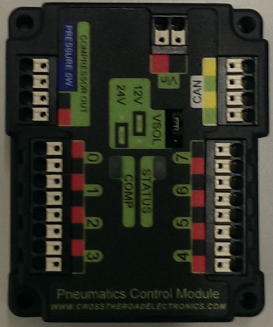 The PCM contains an input for the pressure sensor and will control the compressor automatically when the robot is enabled and a solenoid has been created in the code. The device also collects diagnostic information such as solenoid states, pressure switch state, and compressor state. The module includes diagnostic LED’s for both CAN and the individual solenoid channels. For more information see the PCM User Manual. 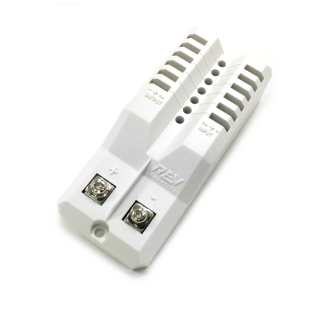 The VRM is an independent module that is powered by 12 volts. The device is wired to a dedicated connector on the PDP. 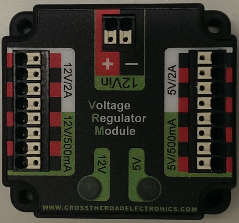 The module has multiple regulated 12V and 5V outputs. 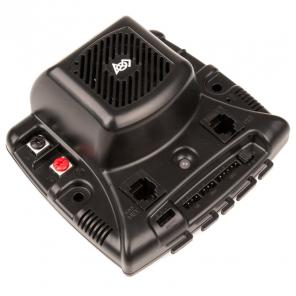 The purpose of the VRM is to provide regulated power for the robot radio, custom circuits, and IP vision cameras. Note: The two connector pairs associated with each label have a combined rating of what the label indicates (e.g. 5V/500mA total for both pairs not for each pair). 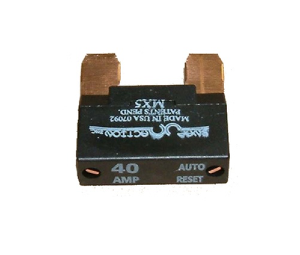 The 12V/2A limit is a peak rating, the supply should not be loaded with more than 1.5A continuous current draw. For more information, see the VRM User Manual. There are a variety of different motor controllers which work with the FRC Control System and are approved for use. These devices are used to provide variable voltage control of the brushed DC motors used in FRC. They are listed here in alphabetical order. 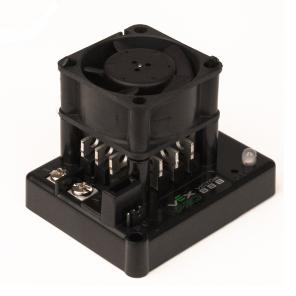 The Jaguar Motor Controller from VEX Robotics (formerly made by Luminary Micro and Texas Instruments) is a variable speed motor controller for use in FRC. For FRC, the Jaguar may only be controlled using the PWM interface. For more information, see the Jaguar Getting Started Guide, Jaguar Datasheet and Jaguar FAQ on this page. The Talon Motor Controller from Cross the Road Electronics is a variable speed motor controller for use in FRC. The Talon is controlled over the PWM interface. The Talon should be connected to a PWM output of the roboRIO and powered from the Power Distribution Panel. For more information see the Talon User Manual. 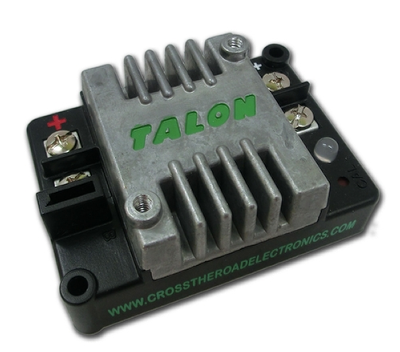 The Talon SRX motor controller is a CAN-enabled "smart motor controller" from Cross The Road Electronics/VEX Robotics. 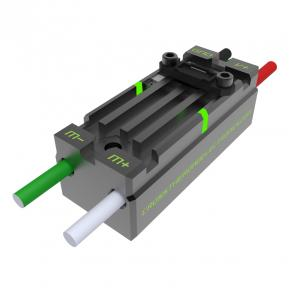 The Talon SRX has an electrically isolated metal housing for heat dissipation, making the use of a fan optional. The Talon SRX can be controlled over the CAN bus or PWM interface. When using the CAN bus control, this device can take inputs from limit switches and potentiometers, encoders, or similar sensors in order to perform advanced control such as limiting or PID(F) closed loop control on the device. For more information see the Talon SRX User Manual. The Victor 888 Motor Controller from VEX Robotics is a variable speed motor controller for use in FRC. The Victor 888 replaces the Victor 884, which is also usable in FRC. The Victor is controlled over the PWM interface. The Victor should be connected to a PWM output of the roboRIO and powered from the Power Distribution Panel. For more information, see the Victor 884 User Manual and Victor 888 User Manual. The Victor SP motor controller is a PWM motor controller from Cross The Road Electronics/VEX Robotics. The Victor SP has an electrically isolated metal housing for heat dissipation, making the use of the fan optional. The case is sealed to prevent debris from entering the controller. The controller is approximately half the size of previous models. For more information, see the Victor SP User Manual. The Victor SPX motor controller is a CAN or PWM controlled motor controller from Cross The Road Electronics/VEX Robotics. The device is connectorized to allow easy connection to the roboRIO PWM connectors or a CAN bus chain. When controlled over the CAN bus, the device has a number of the closed loop features also present in the Talon SRX. The case is sealed to prevent debris from entering the controller. For more information, see the Victor SPX Webpage. 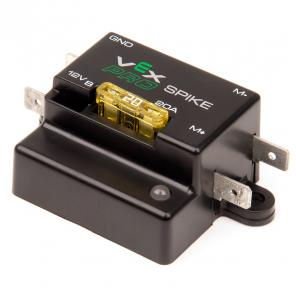 The Spike H-Bridge Relay from VEX Robotics is a device used for controlling power to motors or other custom robot electronics. When connected to a motor, the Spike provides On/Off control in both the forward and reverse directions. The Spike outputs are independently controlled so it can also be used to provide power to up to 2 custom electronic circuits. The Spike H-Bridge Relay should be connected to a relay output of the roboRIO and powered from the Power Distribution Panel. For more information, see the Spike User's Guide. The Servo Power Module from Rev Robotics is capable of expanding the power available to servos beyond what the roboRIO integrated power supply is capable of. The Servo Power Module provides up to 90W of 6V power across 6 channels. All control signals are passed through directly from the roboRIO. For more information, see the Servo Power Module webpage. The Axis M1013, M1011 and Axis 206 Ethernet cameras are used for capturing images for vision processing and/or sending video back to the Driver Station laptop. The camera should be wired to a 5V power output on the Voltage Regulator Module and an open ethernet port on the robot radio. 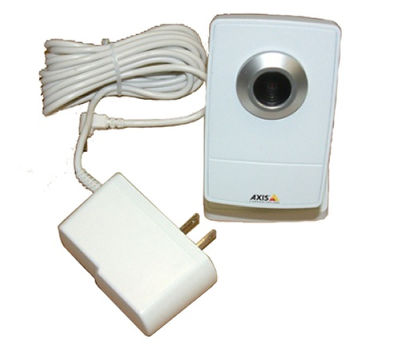 For more information, see Configuring an Axis Camera and the Axis 206, Axis M1011, Axis M1013 pages. 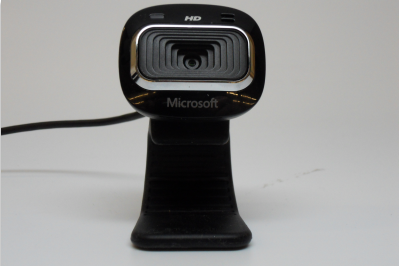 The Microsoft Lifecam HD3000 is a USB webcam that can be plugged directly into the roboRIO. The camera is capable of capturing up to 1280x720 video at 30 FPS. For more information about the camera, see the Microsoft product page. For more information about using the camera with the roboRIO, see the Vision Processing section if this documentation. Either the OpenMesh OM5P-AN or OpenMesh OM5P-AC wireless radio is used as the robot radio to provide wireless communication functionality to the robot. The device can be configured as an Access Point for direct connection of a laptop for use at home. It can also be configured as a bridge for use on the field. The robot radio should be powered by one of the 12V/2A outputs on the VRM and connected to the roboRIO controller over Ethernet. For more information, see Programming your radio for home use and the Open Mesh OM5P-AC product page. The OM5P-AN is no longer available for purchase. The OM5P-AC is slightly heavier, has more cooling grates, and has a rough surface texture compared to the OM5P-AN. 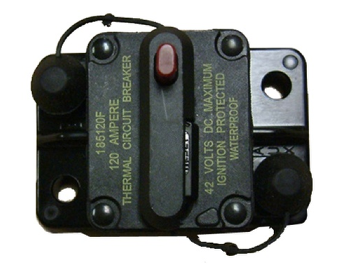 The Snap Action circuit breakers, MX5-A40 and VB3 series, are used with the Power Distribution Panel to limit current to branch circuits. The MX5-A40 40A MAXI style circuit breaker is used with the larger channels on the Power Distribution Panel to power loads which draw current up to 40A continuous. The VB3 series are used with the smaller channels on the PDP to power circuits drawing current of 30A or less continuous. For more information, see the Datasheeets for the MX5 series and VB3 Series. The power supply for an FRC robot is a single 12V 18Ah battery. 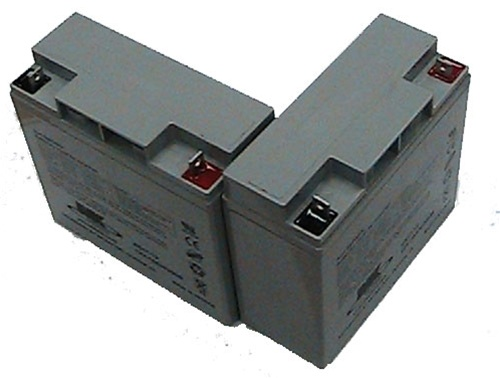 The batteries used for FRC are sealed lead acid batteries capable of meeting the high current demands of an FRC robot. For more information, see the Datasheets for the MK ES17-12 and Enersys NP18-12. Note that other battery part numbers may be legal, consult the 2015 FRC Manual for a complete list. 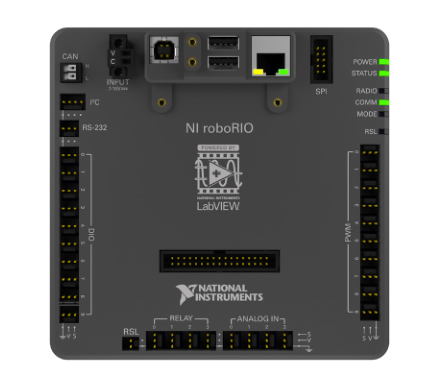 Image of roboRIO courtesy of National Instruments. Image of DMC-60 courtesy of Digilent. 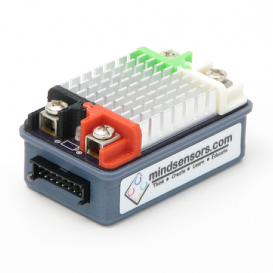 Image of SD540 courtesy of Mindsensors. 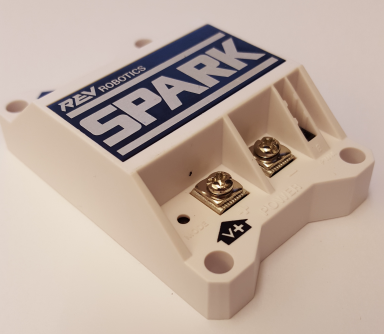 Images of Jaguar Motor Controller, Talon SRX, Victor 888, Victor SP, Victor SPX, and Spike H-Bridge Relay courtesy of VEX Robotics, Inc. 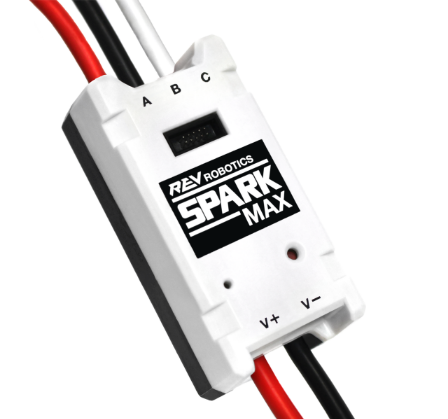 Image of SPARK MAX courtesy of REV Robotics. Lifecam, PDP, PCM, SPARK, and VRM photos courtesy of FIRST. All other photos courtesy of AndyMark Inc.